Now that summer is over, it’s back to school time for over 25 million working moms in the U.S. and their children. Independent of the number of working adults in the household, mothers continue to carry the lion's share of household and care-giving responsibilities. 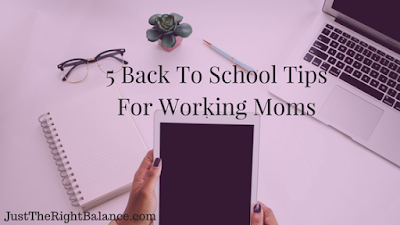 That means trying to juggle both work and back to school related responsibilities like homework, after school activities, sports practices and games, teacher conferences and PTA meetings. Just thinking about balancing it all can bring anxiety and worry. Most children today participate in one or more sport or after school activity like music lessons, advanced academic courses and dance lessons jut to name a few. So how do you manage it all? I remember when my kids were in school (they’re in college now), they were involved in sports, dance, school clubs and volunteer organizations, in addition to a rigorous academic load. To keep them involved would mean driving them to their activities, picking them up, making sure homework was completed, completing paperwork sent home and keeping track of grades. After some trial and error, I decided on a system that worked for me and my family. Below are some tips that helped me to balance the school year and not become overwhelmed. The first month of the school year is the most challenging. During this time, you are receiving forms from teachers to complete by a certain due date, requests for supplies, calendars from coaches about practice time and games and everyone is trying to get adjusted to a new schedule. To try to stay on top of all the paperwork, I selected a time each day where I could focus on school forms and requests. If possible, I recommend, sitting down with your child, if they are old enough, and review the teacher expectations and requests with them. This ensures that your child is aware of your expectations as well as that of the teacher and you make sure they understand what is being asked of them. During this time, you can keep all the forms organized and respond to them right away instead of putting them in a pile to address later. Create a to do list of what is needed. If school supplies, sports gear or other items are needed by a certain due date, include it in your to do list and assign it a due date and tag. I love the app Swipes. I just started using it for my own to do list items and it works well. You can move list items into groups or tags like work, home, family. You can also prioritize your tasks by importance and receive reminders when the tasks are due. An electronic calendar like a Google shared calendar works well. The shared family calendar is where I would enter all activities; that included doctor’s appointments, games, practices and activities. If there are dates that your child's school already has on their calendar like back to school night, a trip, school closings, put these on the calendar as well. Everyone gets a notification with a shared calendar. This is great for sharing with your spouse, partner and older children. You can then decide based on your work schedule who is in a better position to take on what responsibilities. If there is a conflict, knowing ahead of time is key, as then you can pull from your resources of neighbors, friends, family for car rides and other responsibilities. If an electronic calendar does not work for everyone, you can download and print it month by month and put it in a place visible to everyone in your home. Decide with your child what activities are most important. We can stretch our children and ourselves too thin, if we’re not careful. Your child’s success does not solely rely on how many activities they are involved in. Some children are taking on several activities ranging from music lessons, to sports, to advanced math and science courses. Don’t get me wrong, activities have been shown to enrich a child’s life. Organized activities can help them to develop social skills, leadership skills and help them to improve academically. But we must recognize when it’s too much. So how do you know? Here are a few questions to ask yourself. Is my child falling asleep all the time? Is he or she struggling with their grades? Do they have enough free time to help balance their busy schedule? Do they have enough time to spend with family and friends? Are they happy? It’s more important for your child to be well rounded and happy, than to be stressed out and involved in more activities that they can handle. 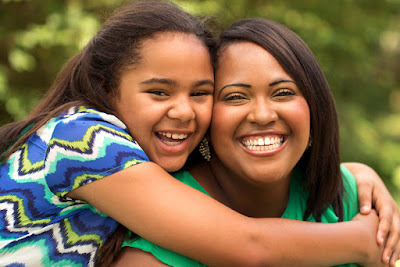 In the end, having regular, meaningful connections with your children will help them better deal with life’s challenges and excel. Mealtime is a great time of the day to connect with your children. As busy families, mealtime often happens on the road and is not spent together. Breakfast or dinner can be a time to catch up on what's happening in your child's life, to reconnect with stories or shared memories and to create a time to have discussions on events happening in the world. I know that having every meal together may be tough. The best way that I achieved this was to plan it in advance. Look at everyone's schedule and see what days and times work best. Have a list of easy meals that you can prepare in under 30 minutes when you are in a bind for time. Also have healthy snacks that easy to package so that they can be taken while traveling to activities. My favorite time saver is cooking 2- 3 meals on the weekend in preparation for the week to help decrease the stress of thinking about what to cook during the week and to save time. I hope these tips are useful for you and your family. Have a great school year! For more information on ways to balance work and home download my free guide. Know another mom who could use these tips, use our share buttons below.